Today we are announcing the BigQuery sandbox, a credit-card free path to enable new users and students to experiment with BigQuery at no cost—without having to enter credit card information. As organizations begin to collect more and more data, many find that a serverless data warehouse like BigQuery is the only platform that can scale to meet their needs. BigQuery also provides a flexible web-based interface for running advanced queries on large public datasets. You can now explore both these benefits of BigQuery with no financial commitment whatsoever. BigQuery is Google’s serverless cloud data warehouse that is so simple that you only need a Standard SQL query and your curiosity to start generating insights. If you’re interested in learning more from BigQuery’s documentation, you can find it here. As a BigQuery sandbox user, you can access the same compute power as paying users, and just like paying users, you get to run SQL queries over large and small data sets as well as use new capabilities like BigQuery Machine Learning and BigQuery Geospatial Information Systems. BigQuery sandbox provides you with up to 1 terabyte per month of query capacity and 10GB of free storage. All tables and partitions have a 60-day retention policy. Some features of BigQuery are not included in the sandbox (DML, Streaming, Data Transfer Service). If you want to use these capabilities, you can simply click on Upgrade in the console (see image below), which will guide you through the process of providing your payment information. We created BigQuery sandbox for users who want to try BigQuery for free without facing the hassle of first having to enter payment information. Students can now use BigQuery for a class or a project without needing to worry about billing. Government or civic employees who want to investigate BigQuery’s capabilities without needing to go through a spending approval process can simply log in, sign up and run a query. Professional developers who want to experiment to see how BigQuery fits into their corporate architecture can test out their integrations. Users of other Google products such as Firebase can now put their data in BigQuery (Firebase actually has an automated pipeline) to see how ad hoc analytics expands the questions that they ask of their data. Scientists and academic researchers who are interested to learn about how cloud computing can transform their analysis. Google Cloud Platform (GCP) has two introductory offers. BigQuery sandbox is a BigQuery-specific initiative to provide easy access to BigQuery without needing to grab your credit card. If you want to experiment with BigQuery right now and other GCP products after, then BigQuery sandbox is where you’ll want to start. Click on TRY BIGQUERY FREE (green oval). The GCP free trial includes a $300 credit that applies across all Google Cloud Platform (GCP) products. If you want to experiment with multiple products, then you can activate the GCP free trial by clicking on the button that says “Try free” (black dashes). Note: the free trial does require a credit card. To start, you can find the BigQuery webpage here. Click on the button that says “TRY BIGQUERY FREE.” Follow the prompts, and in four steps and less than 60 seconds, you’ll land at the BigQuery web interface ready to write your first query. Create a map of hurricane trajectories using the NOAA weather data with the query in this tutorial and BigQuery Geo Viz to plot it. Where do Hacker News stories live? This query parses out the host from the URL so you can see where Hacker News stories originate. Learn more at the Hacker News Marketplace Page from BigQuery Public Datasets. 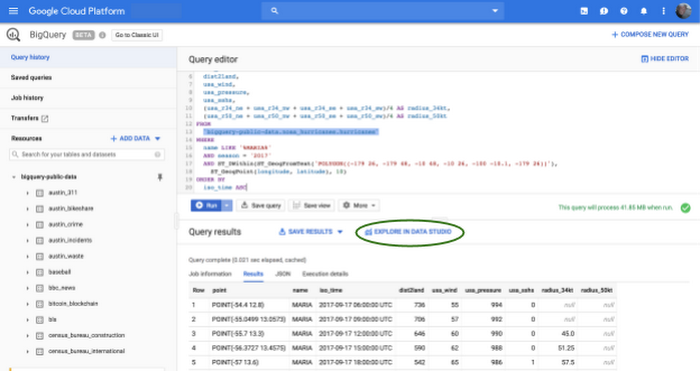 If you are interested in more queries to run and instructions for loading data into the BigQuery sandbox you can look at this great step by step guide from Felipe Hoffa. How does three-point shooting accuracy change at the end of NCAA basketball games? This query compares three-point shooting accuracy from NCAA men's and women's basketball games in the first 35 minutes and the final 5 minutes. Learn more at the NCAA Basketball Marketplace Page from BigQuery Public Datasets. After you’ve run your query be sure to look for this button (see the green oval in the image below) to view your results in Data Studio, Google’s free data visualization product. “Google’s integration of NOAA’s data into its platform’s tools, such as BigQuery, has enabled increased public usage by effectively removing many obstacles related to understanding scientific data formats and the preparation of data for analysis. By introducing lightweight subscriptions to Google services, coupled with limited free tiers of service, Google has lowered additional obstacles to entry for data users." The BigQuery team is keen to hear what you choose as your first query. Please let us know what your first query was by tweeting with the hashtag #bqsandbox. To learn more about BigQuery, RSVP for the BigQuery BBQ in a city near you, where you’ll cook up some exciting data insights over delicious food and win prizes. You’ll be joined by Google Developer Advocates Felipe Hoffa and Minhaz Kazi, to solve our data challenge contest using public datasets available in BigQuery. Or if you'd rather learn from Felipe Hoffa without traveling, you can find his tutorial blog post here, which includes additional content on data loading.